This add-on allows you setup forums based on Question & Answers with just a few clicks. Also, allow users to ask questions while other users are able to answer the question with multiple. Then, the question starter may then mark which answer fits best. Question & Answer Forums allows you to turn your forum into a knowledge base, support portal, or just a questionnaire based community. Also, you can choose which forums are QA based or add a custom widget that allows your users to see which threads are unanswered. 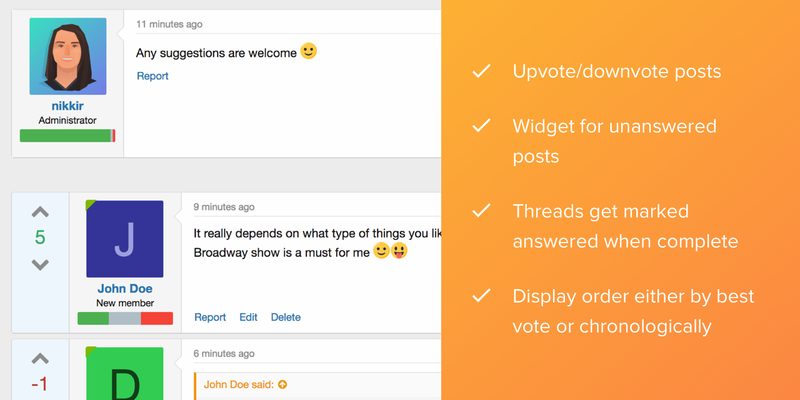 When creating a thread in a Q&A forum the user will be given an option for their thread to use the Q&A format and default to sorting by up/down votes. Optionally, a forum can be set to force all new threads to use the Q&A format. QA Forums allows you to choose which icons you want, which colors you want, and so much more through style properties. Users will receive an alert if their post is marked as the best answer. Several user criteria for use with user group promotions and other systems that support the user criteria system. Can be used to prevent users that usually receive a large number of down votes to be prevented from replying to Q&A threads, for example.